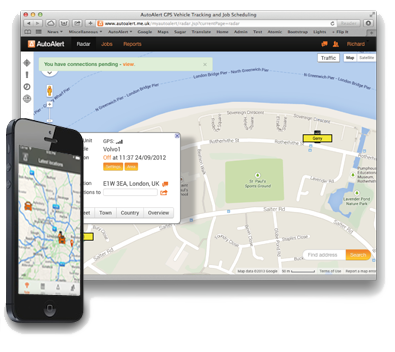 AutoAlert’s real-time GPS Tracking System allows you to monitor the location of your vehicles or engineers using an AutoAlert GPS Tracking Device or via your Smartphone, iPhone or iPad. Which GPS tracking device you choose depends on your requirements. Principally, what reports you need, whether you own your own vehicles or whether you want to monitor an individuals location rather than a vehicle’s. The installed device is typically hidden away within a vehicle and will transmit its location every 90 seconds whenever the ignition is switched on. (or if the vehicle is moved without the ignition). Because the device is installed, much more in-depth reporting such as the driving times and working times are available which is ideal if you fall under the working time regulations. You can also see when the vehicle was stationary and schedule your vehicles more easily as well as save fuel through stationary reports, idling times reports and scheduling reports. Find out more about our Installed GPS Tracking Device. The AutoAlert portable GPS tracking device can be installed in your vehicle but is more often just placed on the dashboard. It can be set to transmit its locations for a particular journey or time period, or you can set it to transmit for an indefinite period of time – provided its battery does not run out. Again, you can monitor the latest location of your vehicles and get simple reporting such as the routes taken, activity reports and speeding reports. The portable unit is often used if you have sub contractors or employees with their own vehicles. Find more about our Portable GPS Tracking Device. With AutoAlert’s iPhone monitor application you can send your location direct from your iPhone as well as see where your other vehicles and engineers are. You can also receive and update jobs and communicate with your colleagues. This is useful if you want to monitor your employee’s location rather than the vehicle and is particularly helpful for Lone worker protection. The downside with the iPhone application is that it can be affected by other applications running on the iPhone. If you have a lot of applications running or are low on memory, then the iOS operating system will automatically shut down applications until memory is recovered.